There are few things more exhilarating than cheering on your favorite team with other fans. If you’re looking for a venue to watch the big game, there are plenty of reasons to get off the living room couch and head to a sports bar instead. Below are the top three reasons you’ll enjoy watching televised sporting events at this type of establishment. Although you can order a pizza or takeout to snack on during the game, you’ll have a wider range of options straight from the kitchen at a sports bar. Many boast buffalo wings, burgers, and other bar foods that are great for sharing with fellow sports enthusiasts in your party. Several establishments also offer salads and additional fare on the menu, which ensures everyone will find something to enjoy and no one will leave hungry. When you watch the game at a sports bar, you will always be surrounded by a captive audience eager to talk about the action. In the group setting, you can bond with others—toasting every time the team scores and celebrating their road to victory. Even if you have a pretty nice TV, you’ll enjoy better views of the game at a sports bar. Most display games on big-screen televisions or projectors, so you can see every score on the field or court. Often, sports bars have TVs tuned-in to multiple channels at once, so you won’t have to pick and choose what you want to watch. 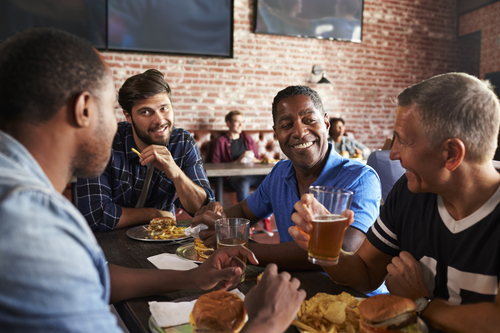 If you want to enjoy the best wings in the country while watching games with friends at a local sports bar, head to Buffalo Wild Wings® in Danbury, CT. Beyond offering an extensive assortment of food options, the restaurant also features a full bar and beer-of-the-month so patrons can try a new favorite brew. To learn more about specials, call (203) 794-9453 to speak with someone at the Danbury location. Visit the restaurant online for additional locations in the Tri-State area, and like them on Facebook to see pictures of the cuisine.